retractable ID badge holders all share a very similar anatomy. 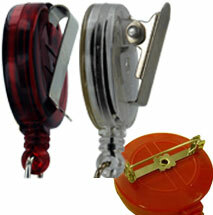 The badge reel case is made of plastic, metal or a combination of metal and plastic. The most common shape is round, but square and custom shapes are also being used. The plastic badge reel case is typically available in a variety of colors ranging from solid black to translucent purple. The case housing holds both the cord and a spring that controls the uptake of the cord back into the housing. Case housings and springs are available in both economy and heavy duty grade. Typically, the application will determine which style to choose. Both are available blank and custom imprinted with a company name, theme or logo. Clothing attachment hardware is located on the back of the case. A variety of options are available. The most common clothing attachment hardware is a simple belt clip used for attaching to a belts, pants, dress waistlines and pants pockets. The belt clip consists of a strip of bent metal that is held tight to the badge reel via pressure imparted by the bend. Spring clips open like jaws when pressure is applied to one side of the clip. Spring clips are used for attaching bag handles and the like. Less common clothing attachment hardware are bar pins. The pin mechanism enables you to pin the badge reel to a shirt or jacket. Carabiner clips are also available for badge reel. Most badge reel retractable cords are made of nylon with some heavy duty badge reel styles using steel wire, chain link and reinforced nylon for additional strength and durability. 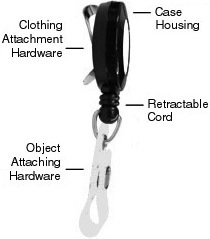 Badge reel cords typically extend from 17 to 34” and retract back into the case housing when let go. The cord is attached on one end to the spring inside the case housing and the other end to object attaching hardware.